Are you protecting your Galaxy S6 edge with a case or leaving it up to chance that its curves will offer enough grip to keep it off the ground? The new Samsung Galaxy S6 Edge+ is the updated version of the S6 Edge. The two devices are very similar, but Samsung has managed to make the S6 Edge+ even thinner than the S6 Edge, despite the larger screen size on the newer device. If you’re planning on purchasing this new smartphone, you’ll want to pick up a case to keep it protected from drops and impacts. Available with clear or smoky black accents, this cool case has a new type of scratch resistant coating. It also has an anti-static treatment, which helps keep dirt and dust from getting embedded in the case. Another improvement to this case model is the New Active Touch technology, designed for a more responsive feel when pushing the volume and power buttons. 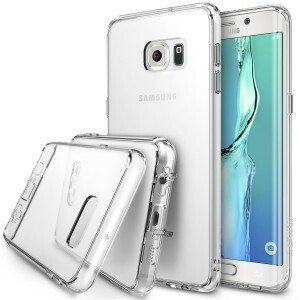 Crystal clear protection enhances the Galaxy S6 Edge+ / Plus original look with minimal bulk. Personalize your Ringke FUSION with free Design It Yourself template for unlimited potentials to fit your aesthetic needs! Fits perfectly on the Samsung Galaxy S6 Edge+ / Plus to show off the natural shape and design. Ringke’s Design It Yourself provides you with a free template to help as you unleash your creativity and personalize your own fully customizable Ringke FUSION protective case. It’s our way of helping you become one simple step closer to suit all your aesthetic needs.